Fridays generally entail some degree of awesomeness, even when they fall in the dead of an icy winter; but at this time of year they're particularly alluring. On summer Fridays, that time-worn TGI prefix transcends the standard five-day workweek population and reaches just about everyone. With a vibe that manages to be both relaxed and exciting, the possibilities seem endless. Whether you're planning a languid round of twilight golf, a trip to the shore, or an air conditioned, indoor Mad Men marathon, a summer Friday seems to provide a special kind of incentive to just do it. It's in that spirit that we're launching a summer series of #DIYFriday golf projects. Each week we'll feature golf crafts and creations... hand-hewn golf gadgets and gizmos... from around the world. Some may inspire you, while others may... um... scare you, but I have no doubt it'll be fun... on Fridays... to see what golfers are crafting. 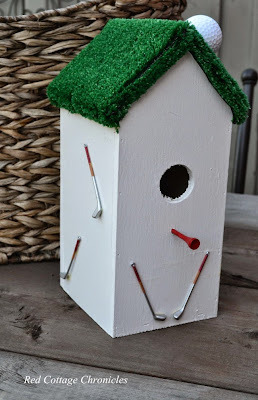 I'm starting out with a unique item I discovered today on a favorite home decor blog of mine, Red Cottage Chronicles. It's a birdhouse for golfers created as a birthday present for aguy who loves both golf and gardening... and apparently it's already occupied by a couple of avian golfers. So this'll be the first of many #DYIFriday golf posts, and if you come upon something crafty and golfy I'd love to see it and share it here. Happy #DYIFriday.